Some time ago I came across the art of a young Italian woman whose work caught my attention. As happens with my online musings, I came across her work perchance and liked it immediately. Arianna Operamolla hails from the Italian city of Bari. This 26-year-old adored design and drawing from a very young age, possibly also strongly influenced by her mother who is an artist. She says she always loved cartoons and comics and so decided to take up art studies eventually following a two-year course in cartoons. 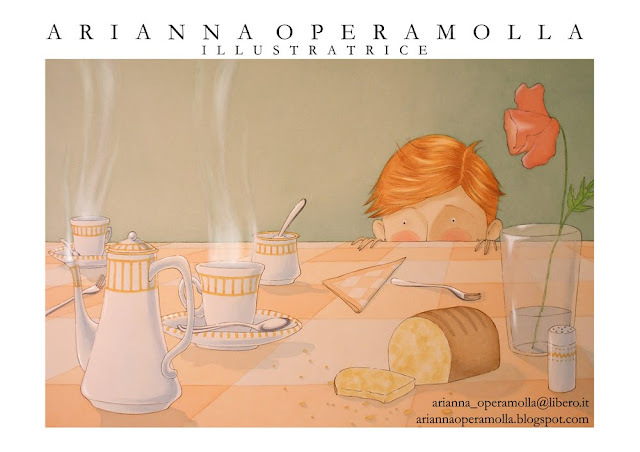 In 2008 she enrolled for a course of studies with Ars In Fabula in the Italian city of Macerata and there she studied for a Master in Illustrations for Publishing. The images featured here are from a series of publicity postcards created for book which never saw the light of day but for which Arianna created 16 different designs. Today she works as a freelance illustrator and collaborates withthe London agency Advocate Art.